Monument famous apple in Almaty, Kazakhstan. Almaty , orAlma-ata Алматы is the largest city in Kazakhstan with a population of 1,421,868 (at 1st of August 2010) with about 9% of the countries population located in one city, it is certainly a hustling and bustling place to be. 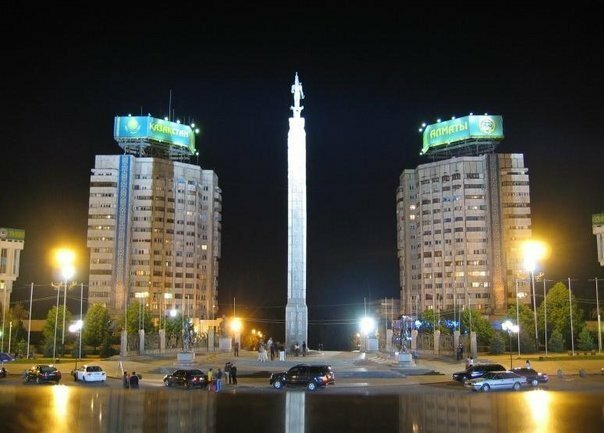 It also used to be the former capital of the country, until 1997 when it moved to Astana. The city is still the centre of commerce for Kazakhstan, with the stock exchange and largest banks located there including Kazkommertsbank, which is the largest bank in Kazakhstan, and one of the largest players in Central Asia. The Stock exchange is the largest in Central Asia and is responsible for a large proportion of the Countries economy. Plans are being developed to increase substantially the financial facilities, and currently under construction is 'Almaty Financial District and Esentai Park. literally means 'city of apple trees', and, because of its relatively mild climate, it has a wide range of apple trees. The Almaty area is said to be the genetic home for many varieties of apples and the area is often visited by researchers and scientists from around the world, in order to learn more about the complex systems of genetics, and also to discover the true beginnings of the domestic apple. 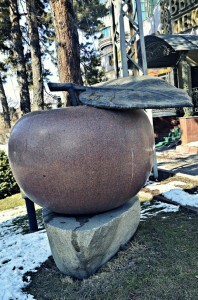 A good traditional story links the taking of the apple from the tree in the old testament to Almaty. The Turkic name for apple is Alma and Ata meaning forefather, which could lay it open to be possibly the origin of the Apple (The garden of Eden). Kazakh National Medical University is a university in Almaty, Kazakhstan. It is the no.1 medical institute in all of Kazakhstan. Many of Kazakhstan’s leading physicians are affiliated with the university. It is dedicated to S.D. 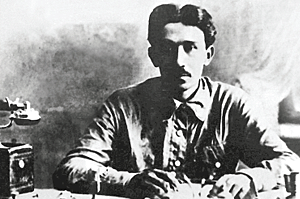 Asfendiyarov who was the first rector when the university was established in 1931. In 2001, the government classified it as a “national” university. There are more than 11000 students, PhD students study at KazNMU, and there are more than 1500 faculty members working at KazNMU, including more than 200 doctors of science, 130 professors, more than 500 candidates of science and 15-laureates of State prizes. Governmentawards Award of the Labour Red Banner, 1981. Membership in the international organizations and associations 1. The international association of universities – International Association of Universities (IAU), 2013. 2. The European Association of Universities – European University Association (EUA), 2012. 3. Association of Medical education in Europe – An International Association for Medical Education (AMEE), 2012. 4. Association of Stomatologic education in Europe – Association for Dental Education in Europe (ADEE), 2012. 5. Open Siberian University association, 2012. Confirmation of quality of activity – National certification DESKR. 2008year. – Diploma SGS «The best system of management», 2012 year. -Institutional accreditation IAAR, 2012 year. – Diplomaoftheactiveorientation work in Almaty and Almaty region in 2013-2014 year..
–The national certificate “the Leader of Kazakhstan 2013” and the 3rd place in National Business a rating among all universities of Kazakhstan in 2014-2015. KazNMU in national and international ratings – – 1 place on the 4th and 3rd place on 1 specialty of a bachelor degree, magistracies and doctoral studies (HAAP PK). – – 10 prize-winning places, from them 9 – the first positions, I have entered TOR-40 on total of prize-winning places (A national rating of medical schools of Kazakhstan-2015 and programs in NKAOKO-2015). – – the 3rd place among higher education institutions of Kazakhstan in the international rating of ARES in 2014-2015. – – the 5th place among higher education institutions of Kazakhstan in the international rating of Webometrics in 2015. 5B074800 – “Technology of pharmaceutical production”. Corporate management – Supervisory board, 2011. – Board of trustees, 2008. – Council of Elders, 2013. Total area Total area – 52 354,9sq.m. The university has 7 educational cases, 7 hostels (2858 places), (since the end of 2012 the hostel on 512 places is under construction), Concordia Theatre on 1200 places, the Test center on 102 places, Educational clinical center – 3458,6 sq.m., the anatomic museum. The rented buildings (9) – 7112,3sq.m. A gym with a total area of 1361 sq.m. onBaytursynov St., 93. In October 2010 scientific research Institute of fundamental and applied medicine named after B. Atchabarov with clinical experimental and scientific-educational laboratories was created for raising scientific research’s level at the University. Science activity accreditation from the Ministry of Education and Science was received in August, 2011. University employees actively participate in realization of 3 scientific projects financed by National innovative fund. 7 scientific and technical projects for a total sum of 70 million tenge on the program “Target development of the university science focused on innovative result” financed by MES RK have been won. 4 STP financed by MH РК are being carried out. Multi-central scientific investigations on priority directions (STP “Mars-500,” Working out of anti-ageing model in providing active longevity of elderly persons”) have been developed. To activate scientific activity in SRIFAM named after B.A.Atchabarov 258 workers of the professorial teaching staff have been involved.They participated in 13 temporarily scientific groups (volume of financing is more than 20 million tenge). For the reported year within the frame of the 80th anniversary of the university over 60 scientific-practical conferences, training seminars were carried out to the persons, responsible for the scientific work at the departments. 6 patents were received by the University in 2011. The workers of the university have published 26 monographies on priority directions of public health, 27-textbooks and educational supplies, 27-scientific-methodical supplies, 1389 articles (16 collections), 88 ones in the CIS countries, 115 ones in far abroad countries, 14 printing works in the international reviewed magazines. At scientific research institute of FAM named after B.A.Atshabarov the fund rising department which helps professorial teaching staff in searching international grants, in accessing to foreign resources of the scientific and technical information has been established, and issue of bulletins with indicating sites is realized. Annually for raising an interest in scientists and researchers of Kazakhstan to the development of a world medical science the “Days of University” are held. Famous scientists from all over the world participate in this event. “Human health risk assessment laboratory” was created according to organizational structure of the Department of General Hygiene and Ecology. The primary activity purpose is: assessment of risk for the human health from chemicals influence (air environment – atmospheric air, water, water objects, soil, foodstuffs, dwellings and public building, planning and building) and including other factors of influence. The basic functions of Laboratory activity is implementation of research work by the orders of state power bodies, including bodies of state sanitary-epidemiological supervision, industrial enterprises and project organizations, individual businessmen, legal organs and natural persons. implemented the order of LLC “Karachaganak Petroleum Operating B.V.” (КPО B.V.) jointly with LLC “Kazakhstan Agency of Applied Ecology”(КАAE) : the “Calculation sanitary-hygienic zone of Karachaganak Oil and Gas Condensate Field”, that is ratified by the Main state health-officer of RK Bekshin Z.M. within the framework of МES of RK Program realization “020 Preparation of Specialists with Higher and postgraduate Education and Providing Social Help to Students” Master-classes were conducted with bringing in specialists of international rate. conduct pilot projects in the most densely populated cities like Almaty, Astana and others as these are the most subject to contamination of environment. 1. Medeu Skating Rink: Situated approximately 5,548 ft. above sea level (that’s 1,691 meters) Medeu is considered to be the highest skating rink on earth. This skating rink and ski resort is a favorite for locals and visitors alike, and offers enough room for people to figure skate, speed skate, play hockey, and have a ton of fun. Be sure to do your stretches; not only for ice skating, but also for the 842 step staircase that leads to Medeu. The climb is worth it. 2. Zenkov Cathedral: This is a place where you surely want to use your “inside voice.” Zenkov Cathedral is over a century old and is still a functioning place of religion. Located in Panfilov Park, Zankov Cathedral is a popular tourist destination. Besides the breathtaking beauty that brings people to this site, the interesting history is enough to make you want to see the cathedral for yourself. During Soviet Times, Zenkov Cathedral was used as a museum and concert hall, but in 1990 it was restored to its original state. Want to know one of the coolest pieces of information about this place? It is one of the only wooden cathedrals in the world and it was built without using any nails. Crazy, huh? 3. City Tours: What better way to learn Almaty than to follow an expert around the city to learn all the ins-and-outs? There are several great tours in Almaty such as Almaty City Tour and Center Smart Tourism. However, Walking Almaty, a walking tour with our friend Dennis Keen, is an awesome way to learn about Kazakhstan. Dennis is an American who has lived and studied in Kazakhstan for several years, and can’t seem to leave. His tours include unique looks at the city, and he takes what some may consider to be “mundane” and tells the interesting stories behind them. Join Dennis (who is very friendly, by the way) on a walk around Almaty and you will not be disappointed. 4. Kolsai Lakes: These three lakes are very popular destinations near Almaty. Surrounded by all of nature’s beauty and rare wildlife, visiting these lakes is a great option if you want to escape the hustle and bustle of the city and enjoy a serene atmosphere. It is possible to reach the first lake by car, but you have to park there and travel to the other two lakes either by foot or on horseback. It is said that it takes approximately one day in order to travel from the first lake to the third lake and back. Sounds like an awesome adventure! 5. Panfilov Park: Located in Central Almaty, this park is a welcoming spot for people of all ages. This park is named after a group of brave Almaty soliders who died fighting off Nazis in WWII. There was 28 of these soliders, and they were called the Panfilov Heroes. These heroes, along with many other Soviet war heroes, are honored at a memorial adjacent to the Zenkov Cathedral. 6. Big Almaty Lake: Big Almaty Lake is approximately 18 miles (28.5 km) from the city of Almaty. The lake is considered part of Alatau – Eliy National Park, and is quite a popular destination for tourists and locals alike. Big Almaty Lake is surrounded by three gorgeous mountains, creating a stunning, tranquil atmosphere. Though the lake is used for water supply and hydroelectric power for Almaty, this does not disturb its natural aesthetics. Go to Big Almaty Lake to hike, picnic, take photographs, or just be in nature. You will never forget it. 7. Kok-Tube Hill: Take a fun-filled cable car ride to the top of Kok-Tube Hill where you will witness the city of Almaty from a bird’s-eye perspective. While at the top of the hill, gaze at the mountains or look longingly at the vineyards below, imagining what those grapes will taste like as a wine. The view is not the only great thing about Kok-Tube Hill, though. Guests will find shops, restaurants, a small zoo, children’s playgrounds, and more here. Come for the view, for the food, or just to relax. We guarantee you will never want to leave. 8. Almaty Central Park: Once known as Gorky Park (named after Russian author Maxim Gorky), Almaty Central Park has grown to be one of the best attractions in the city. Boasting 247 acres (100 hectares) of land, Almaty Central Park is great for all ages and offers a variety of activities. Sure, you can come here and go for a nice walk, have a picnic, read a book, and just relax. But Almaty National Park also provides an on-site waterpark called Aqua Park, a movie theatre called Rodina, and right across the street from the park is the Almaty Zoo. Be sure to set aside a good amount of time for Almaty Central Park. 9. Kazakh Museum of Folk Musical Instruments: The ancient and folk music of Kazakhstan is pleasing to the ear and unique in sound. So what are those instruments called that are responsible for such beautiful music? The Kazakh Museum of Folk Musical Instruments, located in Panfilov Park, displays all of the rare and unique folk instruments that are present in Kazakh culture. Come to this museum to view the instruments, or try your hand at playing them. You can also watch live performances by ethno-folk group Turan, or throw your child a birthday party here. If you love music, then this is definitely a place to put on your agenda. 10. First President’s Park: This popular place to visit is the home to the famous annual festival “Almaty- My First Love.” Located in the southern part of Almaty and surrounded by breathtaking mountain views, this park boasts natural features as well as attractions. Enjoy a concert at the amphitheater, go for a calming walk, or sit and enjoy the nature of Almaty. Be sure to pack your own food and drink if you come here, as there are no stores or food vendors in First President’s Park. Be sure to take lots of pictures of the perfectly planted flower beds. The trees, however, are not so big, as First President’s Park was originally opened in 2011 for President Nursultan Nazarbayev, but it has since been open for the public’s enjoyment. Well, readers, there you have it. This list of places only scratches the surface of interesting and fun places to visit in Almaty, so let this serve as just a guide for when you’re making your plans of what to do when you visit. Though you will most likely enjoy any of the places on this list, one thing is guaranteed: no matter what you do in Almaty, you will love every second of it.